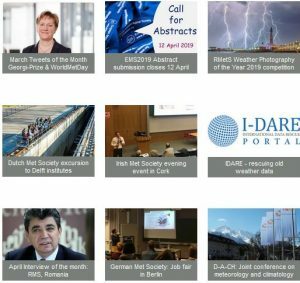 The EMS Journalist Award, launched in 2014, aims to highlight outstanding examples of journalism in the field of meteorology or climate science. Publications that successfully inform and educate the general public are vital to bridge the communication gap between science and society. The award is given biennially. The EMS invites submissions for the EMS Journalist Award 2019. The aim of the award is to support and highlight authors who produce outstanding examples of journalism in the field of meteorology or climate science that help to bridge the communication gap between science including its applications and the public. Work from all types of media is accepted. This can include newspaper articles and features in magazines (print or online, including social media), one-minute TV or radio broadcasts, or any other suitable format. Not accepted are TV weather forecasts, books, extensive broadcast series or movies. An author may either apply him-/herself for the award, or she/he may be nominated/proposed by a third party (Meteorological Societies, Meteorological Services, Associate Member organisations, select committee members and individuals). English-language media are in a favoured position, when it comes to international competition, because of the lingua franca status of this language. However in national or regional media other languages are predominantly used outside of countries with an English-speaking majority. In order to improve equivalent opportunities for non-English-language media, English-language submissions are considered with low priority every alternate announcement of the award. This year (2019), English-language examples will be considered with low priority for this award. A single example as well as a small series of publications (maximum three) is admissible. The submitted work must have been produced during the 3 years preceding the submission deadline, i.e. after 20 May 2016. Permission to publish the work in a suitable format to be agreed with the author on the EMS Media; this permission must be given/secured by the time of submission, otherwise the submission will not be accepted. The Awardee will be invited to attend the EMS Annual Meeting 2019 in Copenhagen. The award will include an award trophy and certificate that will be presented to the author at the EMS Annual Meeting. The recognised work shall either be published as an example of Best Practice on the EMS Website, or summarised and linked to, depending on the type of publication and type of applicable license. The EMS Journalist Award aims to support and highlight authors who produce outstanding examples of journalism in the field of meteorology or climate science that help to bridge the communication gap between science including its applications and the public. English-language media are in a favoured position, when it comes to international competition, because of the lingua franca status of this language. However in national or regional media other languages are predominantly used outside of countries with an English-speaking majority. In order to improve equivalent opportunities for non-English-language media, English-language submissions are considered with low priority every alternate announcement of the award. As the current planning foresees a biennial giving of this award, English-language examples will be considered with low priority for this award in the years 2019, 2023, and so on. For non-English media, a translation in English is required. For larger volumes at least a summary is required. Authors will need to keep in mind that for non-English work the summary will be the basis for the assessment by those committee members that do not have a working knowledge of the respective language. The submitted work must have been produced during the 3 years preceding the submission deadline. The documentation required for the application or nomination must include full name and contact details of the author, suitable documentation of the report or media file in digital format (PDF-file containing a scan of the original paper, an internet link, an audio or movie file or similar). Permission to publish the work in a suitable format to be agreed with the author on the EMS Media must be given/secured by the time of submission. Otherwise the submission will not be accepted. A selection committee of at least five, including one member of the EMS Media and Communication Team, is responsible for the announcement of the award and the selection of the winning entry among the submissions. Three experts of the committee are appointed by the EMS Council on a yearly basis. The selection committee will normally work by e-mail. A telephone conference may be called should this be advisable. Nominations and applications for one of the Media Awards can be transferred to a different category should the respective committee find it more suitable for a different type of award. This process should be completed within a week after the application deadline. The majority of committee member votes decides on the selection. A committee member should abstain from voting in case that he/she collaborates or has collaborated with the author of the submission. Each year the award is announced not more than one awardee is selected. The Awardee will be invited to attend the EMS Annual Meeting. The award will include an award trophy and certificate that will be presented to the author at the EMS Annual Meeting.